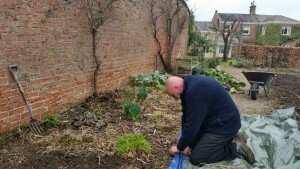 Keith clearing away dead growth to examine plants before lifting. I have been working with one of my gardeners, Keith, over the past few days renovating a lovely long border running the full length of an old brick wall. The border is filled with a wonderful range of herbaceous perennials which many people cut back for winter. However here, many have been left with their seed heads over winter to attract wildlife. These perennials are mainly tall and mid-summer to autumn flowering. Many were heavily compacted and in need of lifting and dividing. Keith and I cleared away dead growth and lifted each plant, discovering a large infestation of bindweed in some places and couch grass in others all of which we removed as much as possible and stored separately for removal from site. The rest of the waste was added to the compost heap or set aside for the bonfire. 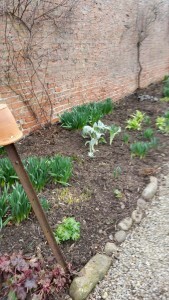 Plants were divided, dead growth removed and then we carefully replanted everything in new groups along the border. The area was dug over to remove any remaining weeds and unwanted plants, including some particularly invasive bamboo, the stone edging between border and path cleaned up and the path raked to remove any rubbish. Once completed the border looked clean and tidy and filled with fresh new plants from the old compacted clumps, some of which produced so many plants a temporary nursery bed had to be created to store them until a new home was found. 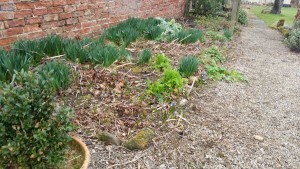 The new plants should look wonderful later in the year when they become established. We will be back in April to fill the gaps with a range of mid to low level perennials flowering in late spring and early summer to contrast the existing plants.